Beauty products are one of the things I will quite happily spend quite a bit of money on to find what works for me but there are some key make-up bits in my stash that I use on a daily basis which are at the more affordable end of the scale, they are the drugstore at it's finest and so I thought I'd give you a little run down on five of the best for under £5 - I may have slightly cheated on one! I have quite oily skin and even with a mattifying foundation, I still find my t-zone tends to get shiny throughout the day unless I use a powder to set it. I go from one extreme to the other with my powder choices, opting for Chanel on some days and the Rimmel Stay Matte Powder in Transparent on others. Obviously the budget option is from Rimmel and this is a great all-round powder that doesn't leave that dreaded cake appearance. I opt for the transparent shade so it doesn't interfere with my foundation and I just love the overall finish when using this. And for £3.99, you can't really complain. This is a relatively new addition to my makeup collection but it is one I've found myself reaching for most days since buying it and that's the Maybelline Brow Drama in Medium Brown. This is perfect if you have relatively fuller brows already (like myself) but just want to tame them and add a slight tint as it sets your brows in place for the whole day and leaves them looking much more defined. I have blonde hair and I use the medium brown shade in this, though I am keen to get my hands on the deep blonde as I think this will be a better match for me and for £4.99, it isn't exactly a splurge! Now for the cult favourite and the one product that has probably been mentioned more times than any other across the blogasphere, the Collection Lasting Perfection Concealer and I'm in the shade Warm Medium. This is one of those cheap and cheerful products that just works. It's great for concealing blemishes, redness and under eye circles and it only costs £4.19. When it comes to eyeshadow, I'm all for the all over the lid kind of product as I find it way too much on a day-to-day basis to worry about blending etc and that's where the Maybelline Color Tattoo 24hr Eyeshadow in On and On Bronze comes in. These are great to blend all over the lids for a subtle or smokey eye look that takes no effort at all and they stick around all day so no worries about creasing. They cost £4.99 and there's a good colour selection available. Okay so this is the one that I cheated on, it is affordable but it comes in at slightly over £5 but I really wanted to include a lip product I love so I thought I'd mention it anyway. I'm all for a matte lip and the Rimmel Kate Moss Matte Lipstick in 107 is the perfect formula and shade if you are looking for a comfortable wear lipstick that lasts all day. I have this berry toned shade but there are also some lovely reds and neutrals depending on what you are looking for. It is priced at £5.49 but I have seen it less than that in some stores! 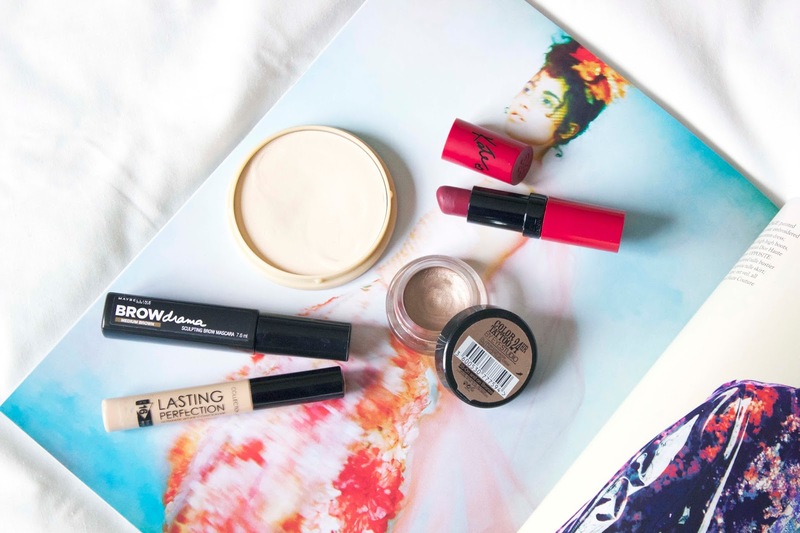 What are you best drugstore finds for under £5?